I was able to do a couple of things on my very rare day off yesterday. First of all I had to catch up on a lot of sleeping and reading. 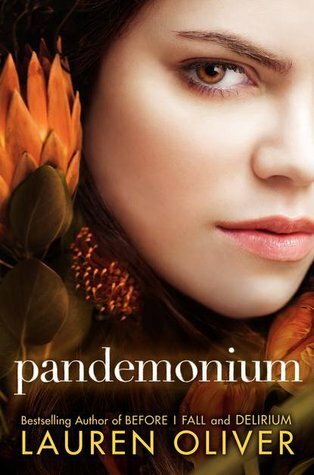 I finished Pandemonium which is the second book from the Delirium trilogy by Lauren Oliver. And I have to say that I enjoyed this book as well. And yes, I’ve been reading a lot of dystopian novels this year. Anyway, the story is told in Lena’s POV which is told in two different chapters which is the Then and Now. Watch out for new characters as well. The story takes off a few months after the events from the first book which is Delirium. Lena is now with the Invalids in the Wilds after Alex sacrificed his life for her survival. I appreciated Lena even more in this second novel. I think she grew up to be a very strong female character. A survivor or a fighter as one might say. I wanted to comfort her during the first parts of the novel since she was sullen and moody most of the time because of her loss. Anyway, I still love the fact that after everything that she’s been through she still managed to grow up and become a strong heroine. There were new characters introduced in the novel as well. The other Invalids plus a new male character called Julian that would probably add a twist in the third novel which is Requiem. I actually like Julian. His innocence is somehow refreshing and I’m actually leaning towards him in a way. Oh, don’t get me wrong I absolutely adore Alex but I am currently in love with Julian after reading Pandemonium. Anyway, to sum it all up I think the first half of the novel was little slow for my taste but as I got deeper into it I just found myself immersed in it completely. The subtle hints of romance between Julian and Lena was just so adorable and I can’t help but root for them up until the very end. I think the latter half of the novel made up for the slowness of the first few chapters of the book. I also liked the fact that even if this book is about love and all that stuff it wasn’t written in this typical cheesy kind of way. Ms. Oliver didn’t write a story about a maiden who is just smitten and in love. She wrote about a strong female who is a fighter and a lover as well. Anyway, I’m giving this a 4/5 star rating. Oh yeah, the ending is just something to die for. What a cliffhanger! haha. Oh BTW, since Lauren Oliver is coming to the Philippines I bought another copy of Delirium for her to sign.hehe. The cover is just so gorgeous don’t you think?